This article explains all you need to know about the best teeth whitening methods, whilst a visit to our tooth whitening hub page will provide links to a number of supporting articles. Nu Skin AP24 whitening toothpaste works by removing surface stains and may make your teeth appear whiter, but it will not change the natural colour of your teeth. The results you achieve by using AP24 will be different to me. Prices do vary depending on where you buy it, but you are looking at around £10-12 per tube. You can buy it direct from Nu Skin here or on Amazon here. The 110ml/110g tube of whitening toothpaste from Nu Skin is rather clinical looking and does not stand out like some of the big brands that use bold and bright colours. In fact, it is rather understated packaging. The box and tube are primarily white in colour with a green colour to the majority of texts printed on both. Once out of the box you are presented with a tube of paste that has a flip top lid, rather than a fiddly screw cap to deal with. You might not realise it until you use a tube of paste with a flip top, but they are so much more convenient. Not only does the tube stand upright on the lid, allowing gravity to do its job helping all the paste out the tube, but using it one handed is much easier too. Before using the toothpaste for the first time, you will need to remove the cap to remove a foil seal on the tube. AP24 toothpaste is white in colour and is not a rainbow of colours like some other pastes. It did not froth as much as some pastes do, which I think it a good thing. My initial reaction during and after the initial clean was that the paste had more of an abrasive taste and feel to it, not quite as smooth as some others, but this feeling dissipated after a day. It is not uncommon to have this feeling, because in the paste is ‘hydrated silica’ which is a mild abrasive that assists in cleaning the teeth and will not erode enamel (when used for short periods of time). There is another ingredient called ‘alumina’ which is a mild abrasive and polishing agent to produce a whiter smile but smooth surface to the tooth. When spitting out excess paste after cleaning, the colour of it was occasionally a light yellow which to me implied it was doing its job, cleaning the teeth and removing staining, plaque and other contaminants. The paste was not as minty or as fragrant as some other toothpaste. Although my teeth felt clean some pastes leave you feeling really dentist fresh feeling, I did not get quite the same sensation here. I did not experience any sensitivity or discomfort when using AP24 from Nu Skin. If you pick a tube of this up and find that you do, stop using it and consult a dentist. Using a pea sized amount of paste each day, you should get about 3 months from this tube of toothpaste. Not a big issues by any means, but I did notice that Nu Skin suggest using the paste within 6 months. Many brands typically say within 12 months, so you have a little less shelf life once opened, but if using every day then you will use it within this time anyhow. Nu Skin calls this product a whitening toothpaste. There are hundreds, if not thousands of different whitening pastes on the market today. The vast majority of these pastes have no peroxides or bleaches within them. AP24 is one of these pastes. Now here is kind of where the catch with whitening toothpaste comes in. For some, a toothpaste like AP24 can make your teeth look whiter, but they don’t actually change the baseline colour of the teeth. A whitening toothpaste that does not contain bleach or peroxide will only ever remove staining and discolouration that exists on the external surface of your teeth. By removing the external staining, the natural colour of your teeth is then revealed. This means that those with no staining will see no colour improvement, whilst those with heavy staining may see quite significant ‘whitening’ of the teeth. It can be difficult for you or me to know whether we have staining or not, so we buy a paste like this hoping for results we may never achieve. When a tube of AP24 typically sells for around £10-12, that is about 3-4 times more than a regular tube of toothpaste, it is quite a premium to pay. This premium can be harder to swallow when the reality of the situation is that, for many, no whitening effect will be achieved and there is a high likelihood that just brushing with a regular tube of toothpaste and toothbrush can achieve similar results. Seems a little hard to believe, but this is the findings of a study and investigation by the team at TV programme SuperShoppers and is supported by comments made by our own in-house dentists. Many of these ingredients are typical of a toothpaste of this type. Hydrated silica and alumina are the more abrasive agents within this paste as are Sodium Lauryl Sulphate (SLS) and C1 77891, better known as Titanium Dioxide. SLS and Titanium Dioxide may be more contentious ingredients for some as there are suggestions (although limited evidence) that both pose a possible health risk. Included is also 1100 parts per million of fluoride a key ingredient to help protect teeth and keep them healthy. This review is not designed to be a clinical study or to say whether you definitely should or should not use this toothpaste. It is perfectly possible to use this as your regular toothpaste on a daily basis, however, I would suggest only using it for a couple of weeks at a time. Every toothpaste can, in theory, be rated on how abrasive they are. As a general rule, the less abrasive, the more gentle on the teeth the paste is and the less possible damage it can do. Coming in at 103 on the Relative Dentin Abrasivity (RDA) scale, this is less than some of the leading competing brands but is within the medium category for abrasivity. The paste does contain fluoride which helps protect the teeth and is an essential ingredient within toothpaste as far as many dental professionals are concerned. This paste nor most others are really created with environmental friendliness in mind. What the impact is during the creation process I am not entirely sure, but disposing of a toothpaste tube is always difficult, they tend to end up in landfill or being incinerated because recycling them is quite tricky. However, some people end up wasting tubes of paste because they don’t like the taste or don’t really understand what it is they are buying in the first place. By reading this review you are less likely to waste money or the tube of paste because you will have a good idea of what to expect and can make your purchasing decision accordingly. There hasn’t been one particular thing that I would really want to see Nu Skin improve. Sometimes there are certain failings with a product that really need addressing, but in this case, such does not apply. Nu Skin has also been pretty good in its description and explanation of this product and is not overselling it with bold marketing claims. This said I do think Nu Skin, as well as most other brands selling whitening pastes, can do more to make it clearer to consumers and potential buyers that not everyone will get whiter teeth by using their products. They should explain a little more what staining is and how not everyone will have stained teeth. Whilst teeth can appear whiter, the actual tooth colour has not changed when these pastes are used, which is something many do not know or realise. Ap24 is not a bad toothpaste. Some of the ingredients might not be to everyone’s liking, but it includes fluoride and has abrasive agents to help life external staining off of the tooth surface. Although within the medium category of the RDA scale, it is rated less abrasive than some other leading toothpaste brands which is a positive. It is not the easiest paste to obtain, you won’t find it within your local supermarket or chemist, so you will have to go online and buy it. The flip lid is a bonus, but I am not sure that combined it is worth 3-4 times that of a regular paste given the potential results. Where can I buy AP24? You will struggle to find AP-24 on the supermarket shelves or in your local pharmacy, you need to head online for it. Priced at £10 when purchased direct from Nu Skin here or at varying prices on Amazon here. It has a mild mint flavour with an aftertaste of vanilla. It is not as strong as many other pastes. Approximately 2-2.5 months based on 2 pea sized amounts being used each day. The following are questions I asked of Nu Skin in my scepticism about the product. Are you able to tell me what is the fluoride makeup within this paste? How many Parts Per Million? The AP-24 Whitening Toothpaste contains 1100 ppm fluoride. And the Anti-Plaque 1500 ppm. What is it within the paste that makes it effective at whitening teeth? Is there one particular component or is it that this paste is more abrasive on the tooth surface than others? Hydrated silica is used in the AP-24 whitening toothpaste as a mild abrasive. Hydrated silica is mild to the teeth and gums, and will not erode enamel. Alumina is used in the AP-24 whitening toothpaste as a mild abrasive and a polishing agent. A polishing agent is designed to produce smooth surface. Alumina is also mild to the teeth and gums, and will not erode enamel. Tetra sodium pyrophosphate is used in the AP-24 whitening toothpaste as a tartar control agent. Published laboratory studies show these agents retard tartar in the mouth. Our toothpaste does not contain peroxides, which a lot of whitening toothpaste contain. Peroxides bleach teeth, but at the same time, they can weaken tooth enamel. When tooth enamel is weakened teeth are more likely to be affected by acid containing and coloured drinks/food sources such as coffee, tea, smoke, red wine and berries, hereby leading to discolouration. 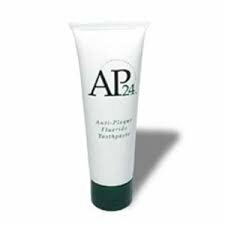 AP-24 Whitening toothpaste brightens, lighten, and remove stains without harsh peroxides and cleansers. So no it does not bleach. I see the recommended usage time is within 6 months compared to many other pastes that are 12, is there a reason for this? I am not sure – It could be because we are extra careful or because we add less preservatives to our toothpaste. I cannot say since I don’t know the percent of ingredient other brands use. It is not of importance to the quality. Are there any clinical studies that show how this is better than those offered from the likes of Oral-B? Since Nu skin is not a medical company we don’t have to do any clinical studies. Still, in some cases we choose to do so and have done so for the whitening toothpaste, so here they are. An in vitro test was performed to determine possible dentin erosion. The test measures a toothpastes tendency to erode tooth enamel. The AP-24 Whitening Toothpaste results were 103 RDA, which is the same as the leading U.S. regular toothpaste, Crest. Crest has been recommended by dentists for over 20 years. Also, an in vitro stain reduction test was performed to determine the percent increase in tooth brightness. The whitening effects were measured after brushing and our toothpaste resulted in 63% increase in tooth brightness. Do you own or have you used the Nu Skin AP24 whitening toothpaste? I have been using this product for over a week now and I have had spontaneous cold sores and my mouth would often feel dry. I am just not quite sure if it is solely about my changing of toothpaste from an organic paste to AP24. I am still on the verge of finding out by alternating my use of organic and AP24. It could be coincidence timing, but there may well be a link between the two. Sodium Lauryl Suphate (SLS)is a common ingredient found within toothpaste. It acts as a foaming agent and can help dissolve dental plaque. It is included in Nu Skin AP24. It can trigger an ulcer (cold sore). If you think it is causing cold sores or other irritations, do stop using. Return to the organic paste you were using and see if things get better. Providing you are ok with it, you could then try again and see if the problem occurs again. If so, you should stop using. For more information on ulcers/cold sores read our article on the best treatment for ulcers. A number of ingredients here are on my no-no list. I’ve used activated charcoal toothpaste with good results. I’m a bit of a sceptic so I decided to try the Nuskin Whitening toothpaste first before deciding to become a distributor. I had to be convinced if works first. Initially it was fun to use it because I also used the their toothbrushes. I loved the taste and the smooth feeling and continued for a week. However a little while later I noted that my teeth became a little sensitive and my inner lips were also sensitive so I went back to my regular fluoride toothpastes for a few days. However I did notice that my the sensitivity stopped so I went back to using Nuskin and intermittently with my regular toothpaste. My sensitivity reduced significantly and I quit the regular toothpaste altogether because I couldn’t stand the heavy taste and abrasion .I now use Nuskin full time and already noticed after 3 months of use a huge difference to my teeth. They are definitely smoother, my gums don’t bleed and they are much whiter and almost no stains. The whitening was gradual and seemed to move from the outside of my teeth to the base. Now I’m completely sold on Nuskin Whitening toothpaste but the only concern is lack of information regarding the manufacturing date adn the expiry date on my tube or packaging which I bought in the UK. If anyone can answer this question then my product is ready for full marketing. We do not sell this product, we just wrote a review about it. You will need to contact Nu Skin directly. I have been using nuskin for 2 weeks. I noticed my teeth seem more yellow. Is that possible? Whilst this goes against the trend, as most people see their teeth get whiter, there might be some explanation for it. What colour were your teeth before using? Were they whiter than they are now? Or were they perhaps a darker brown colour? Has you general diet changed (food and drink consumed) over the 2 weeks you have been using it? Hi. My teeth were pretty white before but slight staining. No real changes in diet though. One thing is I noticed a while ago that my enamel seems to be wearing away on some teeth. This makes some of them a bit translucent at the tips. Some teeth are naturally yellow, but if you feel you only had slight staining and your teeth were pretty white before then it would be unusual for your teeth to now loo more yellow, given there is no other significant change in your diet etc. Thinning enamel is another cause of tooth yellowing, but this is unlikely to occur in a couple of weeks you have been using the paste. Brushing too hard and aggressively can be a cause, bristles of the brush need only skim the tooth surfaces. Certain medications and medical conditions can cause changes in tooth colour too, but these are not all that common. It might be worth getting a professional opinion by speaking to and seeing your own dentist. There could be something more serious going on. Been using the toothpaste for just over a week I now have extremely sensitive lips and inside of the front of my mouth. Will stop using the toothpaste but not entirely sure it is the toothpaste as there seems to be very little side effects noted with other users. Always difficult to pin down the cause. If the sensitivity has come about after using the paste it is a logical link to make and you should certainly stop to see if things improve. A shame, but for some an ingredient may react differently. Presumably nothing else in you lifestyle has changed, for example significant diet changes, makeup of soaps you may be using. I can’t find any answers online, hope you can help. Do you know how soon after brushing you can drink/eat? Especially in the AM with coffee. I don’t know if it’s the same concept as getting fluoride at thr dentist, I know you have to wait after that. You should really wait as long as you can. That is not to say go hours without eating or drinking, but somewhere around half an hour is a good minimum time to leave. The longer you can leave it the more benefit to your teeth and gums. But if you clean your teeth and want a coffee 10 minutes after that is fine too. Brushing and then drinking soon after is better than not brushing at all. Life can be busy and its not always possible to leave time between brushing and drinking. Find a balance that works. Yes thank you so much! It’s been hard to find any info online about the product. I appreciate your time. Been using AP24 Whitening and AP24 Antiplaque for the last 36 months and I notice three huge benefits. Have a large network of clients who keep on purchasing every single month a tube of AP24 Whitening and one tube of AP24 Antiplaque. Now they are buying the “family pack” which basically is a very economic pack made of 2 AP24 Whitening, 2 AP24 Antiplaque, 6 toothbrushes and 1 AP Breathspray which is ideal for use after a meal where you don’t have access to brush your teeth. Have several dentists who have tried and they love the “coating and fresh” feeling. As far as the RDA is concerned, the AP24 Whitening is the less abrasive in the market being recomended to small children where the other whitening products out there are only recomended to children over 12 or 13. As far as Nu Skin testing in animals, yes it is true. Nu Skin tests in animals because they are mandatory in several countries where Nu Skin is present for the last 34 years. Nu Skin does not test in animals. However since PETA only list companies that do not test in animals at all, Nu Skin will not be present there. The company’s portfolio is made of more than 600 products around the world, 50% of the revenue is from Pharmanex (supplements and nutrition). In order for Pharmanex to be approved in several countries they have mandatory regulations for animal testing. Pharmanex is compliant. Nu Skin is compliant. If those tests would not be necessary, Nu Skin would never ever do a single animal testing. I hope you have understood this “animal testing listing”. Finally I congratulate this blog and this review as a very professional way to Inform people about the individual experiences from the use of AP24! Well done guys! Thanks for the comments Helder. since fluoride is not to be ingested because of its harmful effects on the body how can this toothpaste be safe to use. I was told to use the toothpaste dry and do not rinse which means I am swallowing the fluoride and other ingredients left in my mouth just by normal swallowing throughout the day. This cannot be safe, the chemicals in this toothpaste are not safe to ingest. Kim. Of course there are differing opinions, but general consensus and opinion is that fluoride is safe. Here in the UK at least it is very much recommended that only toothpastes with this in be used. Kim whoever told you to use the toothpaste dry has given you the wrong information. You will get perfectly good results using water and rinsing. I’ve been using several weeks now. Not noticing much. The person selling it privately to me charges $24 a tube!! Although I just ordered 3 more, (buy 2 get 1 free), I won’t order again. It just isn’t making that big of a difference, if any. I keep looking at the mirror hoping for white teeth…and I brush with it 3-4 times a day. Thanks for the feedback Donna, always appreciated. Be careful brushing 4 times a day, you are really in the ‘over brushing’ territory here which can be bad for your teeth and gums. Can you use AP24 on dentures? It is not really designed for dentures, it is designed to work on the natural tooth surfaces. Yes you can use it on dentures and it does work ? This is really bad advice. You should not use ANY toothpaste (especially one with abrasives) on dentures. I’ve been a dental professional for 20 years, and we always recommend patients do NOT use pastes for teeth on dentures. It can cause small scratches in the acrylic which can then pick up stains, and harbor bacteria and fungal growth, as well as prematurely wear the prosthesis. Here is my suggestion….buy a jar of unrefined pure coconut oil, first thing in the morning place a tablespoon of it in your mouth…and swish for 15-20 minutes while you go about your business. Oil Pulling is natural, not tested on animals and improves oral health, giving you a whiter smile. Does this toothpaste contain an ingredient to help with hypersensitivity? Not as far as we are aware Andrea. Hi Lydia. Glad to hear you have had good results with AP24. I am not a dentist to be able to say for sure, but I would suggest going for the Whitening paste as you have been using. It will remove plaque but focus on the stains. It will be more abrasive. Typically the Anti-plaque would be a better past to use once the whitening has been achieved, as this is likely less abrasive on the teeth and better for longer term use, if that makes sense. No problem Lydia, glad I could help. Do you use this on a dry toothbrush or do you use with water, I have been told to use dry? I used with water. No specific instructions to suggest which way to do it. You’re suppose to use it with a DRY toothbrush and for 2 minutes and 20 seconds. The woman I purchased mine from gave me the specific instructions when she gave the tube. Did they give any explanation as to why? Saliva in the mouth would make it wet anyway. I would like to ask. who is the manufacture of this product that states on the label and which country? The tube we had was made in the USA. The company is NSE Products Inc (better known as Nu Skin). Hi Jon. Thanks for your thorough review. My husband and I have been using this toothpaste for a few weeks and do not find any noticeable difference. We have a good oral hygiene routine already but from reviews thought this would be a good product to try. After it is used up we won’t get it again. The price is definitely a factor but the lack of great results is the main reason. I have tooth sensitivity with other whitening products. One question. Are you supposed to rinse with water after using or not? Sorry to read that you and your husband have not seen benefit from AP24. With any toothpaste you should spit out the excess but avoid rinsing. By rinsing you wash away all the ‘good’ that is in the toothpaste and has coated the teeth to clean and protect them. What if you are allergic to tarter and plaque control ingredients should I not use this? I have started using ap24 and clearly see a difference, my teeth are far from good but had some slight staining from when I smoked, all the staining has now gone but it was only mild to begin with. Makes me feel confidentify to smile so that’s all that matters to me ? As stated in the review, the paste is safe to use as far as we are aware, but if you have any concerns, seeking the advice of a dental professional is advisable. The results for us in our testing were not noticeable, but others have reported gains as a result of using, so it will depend on the level of staining on your teeth as to the impact of the paste on your teeth colour. Do let us know what you think, if you do use it. My friend started selling NuSkin products a few months ago, I have given the AP24 toothpaste a go and I strongly agree it does whitenen your teeth my friends have noticed and have actually asked for some too! I had a half tube left last week when my new one arrived so gave it to a friend to try and she loves it and everyone in the office where she works has noticed too within a few short days! We do know its gonna take time but it really does work!! I will continue to use it! Hi Janet. Great to hear. Do you have any before and after photos that you can share? It would be fantastic to see what a difference it has made for you and those you know. Is it okay for white spots/stains on teeth? Hi Anna. When you say ok? What do you mean exactly? If you mean is it safe, then yes? Will it remove those stains, it certainly should help. Does this oaste clean crowns or dentures. Yes it can be used on these. Nu Skin does not test its cosmetic products on animals, nor do we request others to test on our behalf, except when mandated by law and regulatory agencies. We evaluate our products in clinical tests on human volunteer panels to ensure the efficacy and safety of our products. Sorry you may be misinformed. Nu Skin advocates and subscribes to both the ethical and humane treatment of animals and the protection of human health and safety. When it comes to the company’s nutritional products, Nu Skin adheres to the same philosophy. Nu Skin nutritional and herbal products are consumed internally, and as a result some government regulatory agencies may require animal research to support human safety and product efficacy. In cases when it is necessary to conduct animal studies, we make every effort to do so in an ethical and humane manner and adhere to applicable and approved government- treatment protocols. Thanks for the comments Sharon. Where does this information come from? It comes from the Nu Skin website. Doesn’t mean anything by just being on a website. I know that for a fact Sharon. Any reason how Nuskin wouldn’t be on The Leaping Bunny List then if they’re suppose to be Cruelty Free? Doesn’t mean anything by not being on a website. Isn’t leaping bunny mainly for cosmetics? Nuskin have only just started doing cosmetics. They are primarily an anti ageing and health and wellness company. I doubt very much they would be on any of these lists anyway because of the Pharmanex side of the company. As stated on their website they are quite honest in saying that they only test on animals where it is required by law. As most of their revenue is from the Asian market I wouldn’t imagine they will stop selling in these countries. I’m confident that their skin care products aren’t tested on animals and only on human volunteers so I will continue to use them. Like PETA is so reliable? They could be misinformed. Would the toothpaste be beneficial while wearing braces please ? If it is a fixed brace rather than a removable brace you may wish to avoid using a whitening paste as it could leave the teeth whiter around the brace fixings, but when removed your teeth will normally be professionally cleaned so it should not really be an issue. In this instance our recommendation would be to just use a decent fluoride based toothpaste rather than a whitening paste. You can use it on crowns, as you would other toothpastes, but due to the way they are made it will not whiten them. It does contain sodium lauryl sulfate however which is best avoided, I don’t believe it’s cruelty free either. Think I’ll be sticking with my own products. Love your thoroughness, but as a dentist I see no difference in shade at all, with the angle and light in the last photo making that only look better! As the company says, no whitening ingredients only mild abrasives. 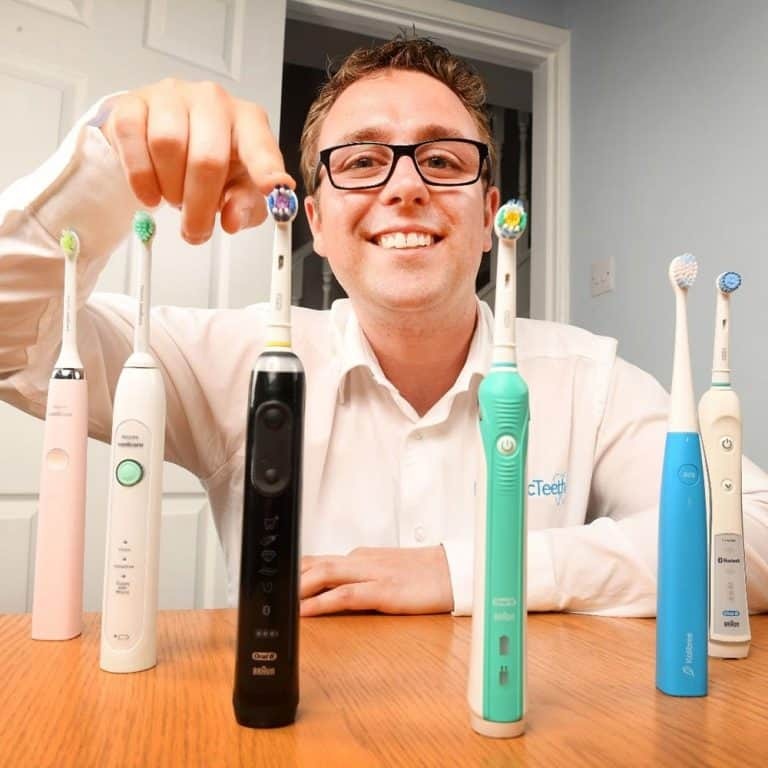 Using an electric toothbrush at the same time changes things aot, in that the gums will be healthier and more plaque removed so teeth look fresher. Thanks for the comments Karen. Good to have a professionals opinion. What are your tips for whiter teeth? Hi Jon, Your thoughts on Sodium Laurel Sulphate in the Ap24 would be greatly appreciated. I also see that Nuskin International aren’t on Peta.org. to verify no animal testing. Caroline, there is clearly evidence for and against the use of Sodium Laurel Sulphate and I am personally not knowledgable enough to provide you with a reasoned argument for and against the use of it; and even if I were this could be come a long comment string where personal opinion and emotion comes into play. Personally from what I do know and have read, I would prefer for less chemicals to be used in any product be that toothpaste or other cosmetics and personally I do not endorse animal testing. There are companies out there that provide more natural products and this is an area we intend to cover further in the future on this site. It does pay however to be educated when recommending products. I myself represent a brand and love how our company provides us with amazing training on ingredients etc. I quite agree in the importance of knowing ingredients if you can especially if you are selling the product and can answer any concerns a customer may have. That’s what I love about the company I represent as they provide all the knowledge training and support to be able to do so. What company/products do you represent Caroline? And what is unique about the products? You can use the paste on caps but you will not gain any whitening from it. This works on only on the natural tooth surface. I have to agree Karen. My son when developing his very 1st teeth came with unsightly staining which also effected his adult teeth. Since using a professional electric toothbrush and using it correctly on a regular basis along with flouride free toothaste containing no nasty chemicals his teeth have never better. I believe tooth whitening pastes are great for those with tooth staining due to smoking etc. I had my teeth professionally whitened at the dentist and was told my teeth would only be as close to their original state and not to expect pearly whites. These are just my thoughts. ?